LOS ANGELES — Winnipeg is tied for the most goals scored in March, but the Jets are also proving that they are just as tough in close games. 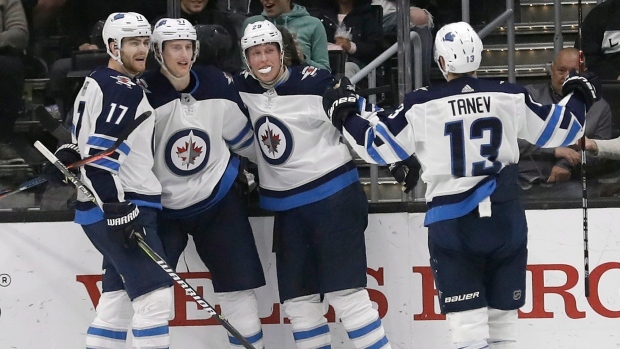 "It's an important win," said defenceman Tyler Myers, who scored the game-winning goal. "I feel like this time of the year games start tightening up and scores get lower. You can tell it is starting to get into that playoff-hockey mode. It's a good type style of play we want to get used to in April and the post-season." "When you think about the Jets it is usually high scoring, but the past couple games we have been playing good defence in the third and squeezing out wins," Hayes said. "That is what it takes this time of the year when you need points." The Kings, though, couldn't manage any offence after that. There was a stretch of 19:27 spanning the second and third periods when Los Angeles didn't get a shot on goal.